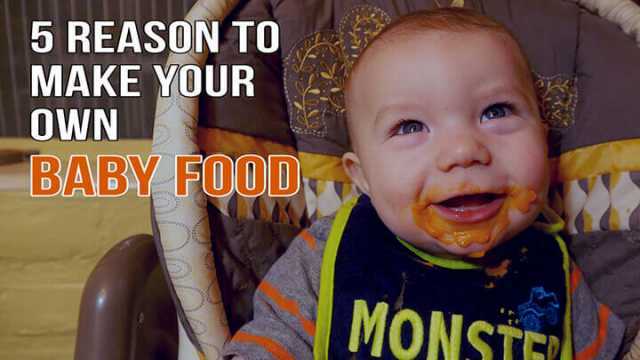 WATCH: Make Your Own Baby Food... It's Easy! Six months ago my life changed forever — in a good way. I became a new mom. If I could say only one thing about the experience, I would say that the learning curve is steep. I might add that “the” learning curve is a misleading phrase, because there are many. I never imagined I would have so many questions! From whether a fever of 102 was worthy of a trip to the emergency room to whether it was okay to let him cry himself to sleep, it has been one uncertainty after another. In many ways, I’m just winging it. When it came to baby food, however, I had very few questions. I took one look at the grocery store aisle devoted to the stuff and decided to buy a baby food blender instead. Part of it was uncertainty about what was in each box. My mind churned as I tried to decipher the “except” items on the many “all natural except” baby food containers. Extra citric acid is good, right? What’s the difference between pear and pear puree? Another part of my decision to make my own baby food was the insane price tags accompanying each tiny tub of nutrients. I won’t spoil the video by telling you more. Here are five reasons to make your own baby food, with a cameo appearance by my little gremlin, Luke. Hey Buddy!, I found this information for you: "WATCH: Make Your Own Baby Food… It’s Easy!". Here is the website link: https://www.thealternativedaily.com/reasons-to-make-your-own-baby-food/. Thank you.